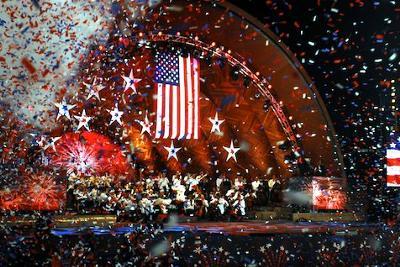 Anyone who knows me knows that I enjoy few things more than watching the Boston Pops and the fireworks on July 4th. Which is why it’s a shame that I hadn’t been down to the Charles in so long to see it live. Last night I corrected that, and got a chance to introduce my friends Justine and Nick to the awesomeness as well. Seriously, no city in America (as if the “in America” part really needs to be said) does July 4th festivities like Boston does. I’ve seen the New York fireworks. They’re big, but that’s all they are. And they don’t have the Pops. But here’s the thing: While I love the fact that the whole country gets to watch some of the show, I do think the national broadcast is what’s wrong with July 4th in Boston. And being there to watch live brought this home for me. National audiences see so little of the Pops concert. In essence, they see the Pops play “backing band” for whoever the special guest is. They see the lame patriotic sing-a-long. And yes, they get the “Stars and Stripes Forever,” including 3 of my favorite minutes of the year, but because the whole night now is geared around this national broadcast, it sorta ruins the rest of the concert. Used to be that the “1812 Overture” was the penultimate number. Now it’s in the middle, with only a small section replayed for the whole country, and it’s anticlimactic. The headliner gets more attention, with the Pops playing second fiddle. And the commercials — the excessive commercials — cut into the flow of the concert, and kill the momentum. During the commercial breaks, that’s when the real Pops music is played. Last night we heard the Pops’ versions of “Sweet Caroline” and “Shipping Up to Boston,” plus the theme from E.T., among other numbers, during the commercials. Don’t get me wrong: I really enjoyed last night’s concert and fireworks. The Pops were good, Martina McBride sounded great, and the fireworks were incredible. Song choices may have been obvious (Katy Perry’s “Firework?” Owl City’s “Fireflies?”), but some of the fireworks themselves — like the ones during “Firework” that burst and then burst a little bit faster — were very cool. Why can’t the national broadcast be extended by 30 minutes so the rest of the country can see and hear more of the good stuff? It does a disservice to the Pops and to audiences, both at home and along the Charles. Sure, there’s nothing that compares to being there to watch the Pops and see the fireworks live. Watching on TV is never a close second choice option. But it could be better, and I hope some day it is.